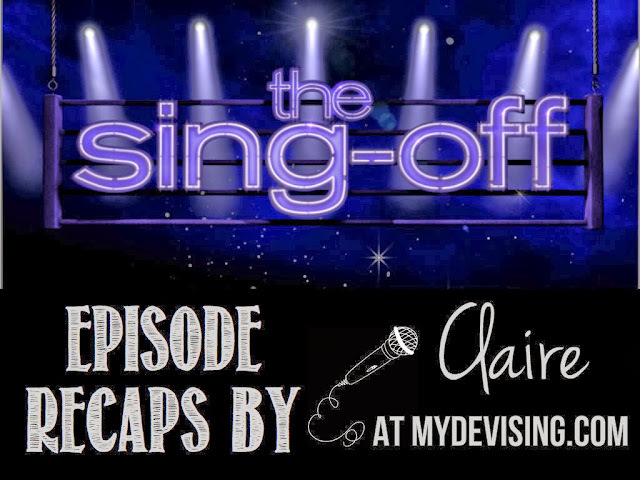 Let me give you some background: The Sing-Off is a show made up of groups that are using only their voices/mouths/bodies to create the sound you are hearing. No other instruments allowed. If you've never been a part of an a cappella group, you know this is a challenge. And you also know that this is why this show is the epitome of all "singing" shows. It showcases true, raw talent. I want you to know that I am a genuine lover of music and of the human voice. I am this show's biggest fan. I am passionate about it. I love a cappella music, I love singing it, and I love listening to it. This song easily lends itself to a choir and to an a cappella arrangement. It was a nice way of starting the show off in a way that everyone could feel successful. The sound was great! Vocal Rush: "Bottom of the River"
My first initial observation was their young sound. It wasn't bad, it was just obviously young. The soloist was strong and, as a group, they were very in tune. Looking back, this was one of the best groups of the night. Although they were great, I'm looking forward to hearing something less chordal, more exposing, and an arrangement with more intricate melodies/BGVs/chords/etc. Um, not a fan right at first simply because guys that purposefully prance around in towels on camera typically aren't my favorite. Then I found out they had mainly a country feel. Then I found out they were singing one of my least favorite songs. The odds were not in their favor. They weren't terrible, but they weren't impressive. Harmonies needed to be tighter at moments. It was pretty basic a cappella stuff and that song easily lends itself to an a cappella arrangement. I'd like to see them do something more challenging. I love how in their intro video they claimed they weren't stuffy and then they TOTALLY WERE! Here's the deal - I typically love all boy groups. But on this show, it seems the larger the boy group, the less I like it. Also, I haven't really been a fan of many of the University groups in the past. Because, sorry, there IS naturally an amount of stuffiness you carry with you. I applaud them for their risky song choice and for their initial feel at the beginning of the song. I wish they would've stuck with that for the rest of the song. There were also some shaky moments with solos. In general, I didn't love the arrangement. The BGVs didn't complement the melody of the song. Calle Sol: "Pon De Replay"
Another risky song choice! They do not sing my favorite style of music, but I enjoyed it! Their arrangement was nice, their octaves were well tuned, and they had strong vocals. However, the percussion section was weak and I don't know how long you can survive on this show if that's the case. My favorite part was somewhere in the middle - they hit a really cool/hard chord and nailed it. I'm interested to see what else they can do. Coming into this competition with a very specific style (whether country, Latin, doo-wop, etc.) can make things challenging. Street Corner Renaissance: "What Makes You Beautiful"
(I said to Colt, "Hey, it's Old Direction!" He didn't laugh that hard.) Yes, there's one every year - an old group that sounds old, looks old, and sings old. This group, like a group last season, has a doo-wop style. Again, having a really specific sound can either help or hurt you. I have nothing against doo-wop, but because this is modern singing competition, I'd like to hear a new, young take on doo-wop if we're going to do it. My automatic feeling is that they won't last long. Ten: "Tell Me Something Good"
And boy did they. They told us many things good about themselves. My first impression is that this group, despite their gospel/church background, is NOT humble. One girl even said she pretty much gave God an ultimatum - "If you don't make something happen with my music, I'm quitting." Eesh. All of this automatically made me want to not like them. However, they were really tight, their vocalist was crazy, and they were pretty amazing. I'm okay with being a fan, but right now, they're not on the top of my list simply because of their attitude. Before they opened their mouths, I crossed my fingers and hoped they would maybe be reminiscent of last season's powerhouse girl group, Delilah. The opening of their song was wonderful. I l-o-v-e-d the chords they used. I really liked the group and the BGVs, but I did not like the soloists. I'm hoping they have some other soloists up their sleeve for future episodes. The intense, vibrato-filled solos just didn't match the smooth, blended, straight BGVs. But all of that to say, I can tell I like their arranging style and I like where they're going. I definitely want to hear more. Voice Play: "Feel This Moment"
Soloist made me so, so nervous. I didn't love the vocals or the chords they chose. I would've gone a different route with this arrangement. There were some very short moments that were cool, but there was an overall unsettled/unsure feeling I got from them. I will say, their little breakdown they did towards the end was really fun. If they continue on, I'd want to see more consistency from them. I feel like things were all over the place. A boy group that loves the 90s?? My ears were perked. They had a nice sound, great solo, and were really tight. They did rush at the end and it just about fell apart. They didn't blow my socks off, but they were definitely good. First of all, typing their name is going to be a pain. Second of all, I was annoyed at their song choice, but I guess someone had to do it. They were very entertaining, had a big sound, and were fun to watch. There were some really great solo vocals! They had a moment of rushing, but held it together. I'm not usually a fan of big, hype guy groups, as I mentioned earlier, so my tendency is to not like them. I also can only handle so many pelvic thrusts in one song. Also, why can guys do this and it's funny, while when girls do it, it's slutty and inappropriate? Annoying. Anyway, they aren't in my top mostly because of the hype, but I do think they did a nice job. It was apparent in the sing-off at the end that Voice Play was doing cooler stuff than The Princeton Footnotes. Goodbye, Footnotes! Let's discuss Jewel. I LOVE her! She's smart and sassy just like Sara Bareilles was. She knows music theory, and it's nice to hear someone refer to "Do" as "Tonic" on TV. She's the perfect addition to the panel.